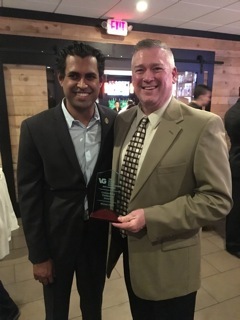 Sen. Vin Gopal (left) presents Mike Evans with award. Wanamassa firefighter Michael Evans was awarded the “Community Trail Blazer Award” at the annual awards reception of the Vin Gopal Civic Association held on April 3 at Mar Belo Restaurant in Long Branch. Evans has been a member of the Wanamassa Fire Company since 1980 and has served as chief in 1989, 1999, 2008, 2012 and 2013. He also serves as the Deputy Coordinator for the Ocean Township Office of Emergency Management. The Vin Gopal Civic Association is a 501c3 nonprofit organization which provides scholarships and support for organizations and families in need.